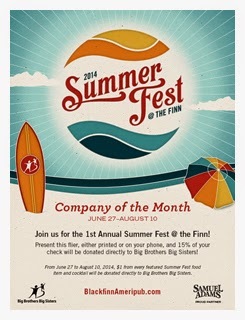 St, Chicago, IL 60654 (312) 836-0290) is hosting Summer Fest @ the FINN now through August 10 to benefit Big Brothers Big Sisters. The national campaign provides a special Summer Menu where $1 from each featured food item—and 100% of limited edition drinkware —will be donated to BBBS at the end of the summer. Guests will even have the option to donate at the bottom of their receipts, if they’d like to make a gift on the spot! When you stop by, make sure to tweet (@BfinnAmeripub and @BfinnRiverNorth) and share your experience! They are the perfect place for friends, family and business patrons to meet for lunch, dinner, happy hour, game day, late night and community gatherings. They have locations in: Austin, TX Charlotte, NC Chicago, IL Jacksonville, FL Merrifield, VA Morrisville, NC (Coming Soon), Mt. Prospect, IL Royal Oak, MI Washington, DC. Big Brothers Big Sisters, the nation’s largest donor and volunteer supported mentoring network, holds itself accountable for children in its program to achieve measurable outcomes such as educational success, avoidance of risky behaviors, higher aspirations, greater confidence and better relationships. Partnering with parents/guardians, schools, corporations and others in the community, Big Brothers Big Sisters carefully pairs children ("Littles") with screened volunteer mentors ("Bigs") and monitors and supports these one-to-one mentoring matches throughout their course. The Big Brothers Big Sisters Youth Outcomes Survey substantiates that its mentoring programs have proven, positive academic, socio-emotional and behavioral outcomes for youth, areas linked to high school graduation, avoidance of juvenile delinquency and college or job readiness.